FS: Grand Seiko SBGA211 "Snowflake"
I don't know if anyone likes watches but I figured I'd take a shot. Includes: Box (inner and outer) and papers. Condition: The watch is 2 months old and shows minor desk diving marks and hairlines. Please review the pictures as these are intended to be part of the description and depict the condition of the watch. If you are not familiar with Grand Seiko, Grand Seiko since 2017 has been a standalone brand and no longer carries Seiko branding on its watches. The first watch they produced was in 1960 and was meant to equal the quality and finishes of watches produced in Switzerland. The Spring Drive movement is an amazing piece of engineering that uses the mechanical energy from a mainspring and winding rotor and is regulated via a non-mechanical escapement. The non-mechanical escapement provides astonishing accuracy also helps propel the second hand smoothly around the face of the watch. Last futzed with by Panda; September 26th, 2018 at 11:09 AM. I like watches and that one is cool. I find a calculator watch is more useful for me though. The Casio I have is $18.79 at Walmart. Good luck with the sale though! Thanks! I used to have this when I was younger. 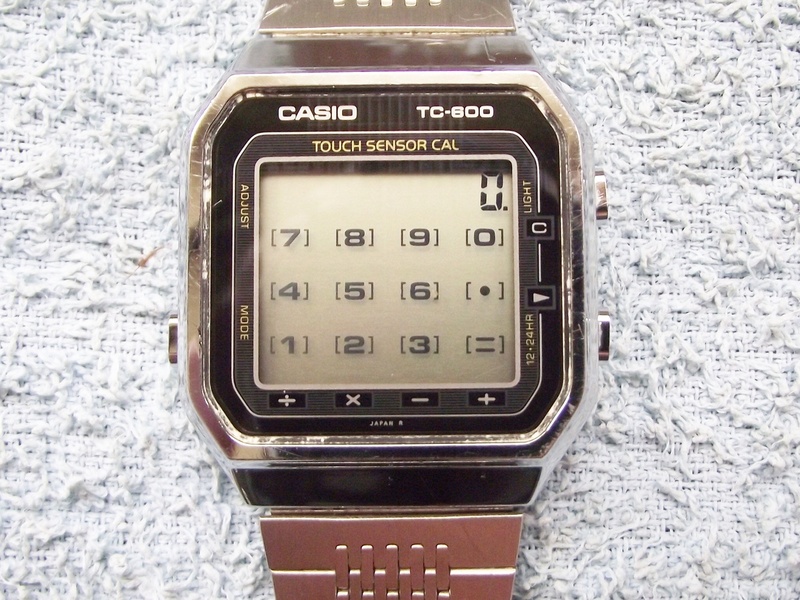 I loved this calculator watch. Thank you! For the price point the level of finishing on Grand Seikos is amazing. Do you collect modern pieces or vintage pieces? I like that touch screen Casio. I've had the metal and plastic cased ones, but never knew they made the touch screen version. I little of both. I took some watch making classes for a couple years and collected some mid century Swiss watches. Then about five years ago Seiko had the fiftieth anniversary of the Seiko 5. Since then I have had an interest in Seiko. I love the Seiko 5. 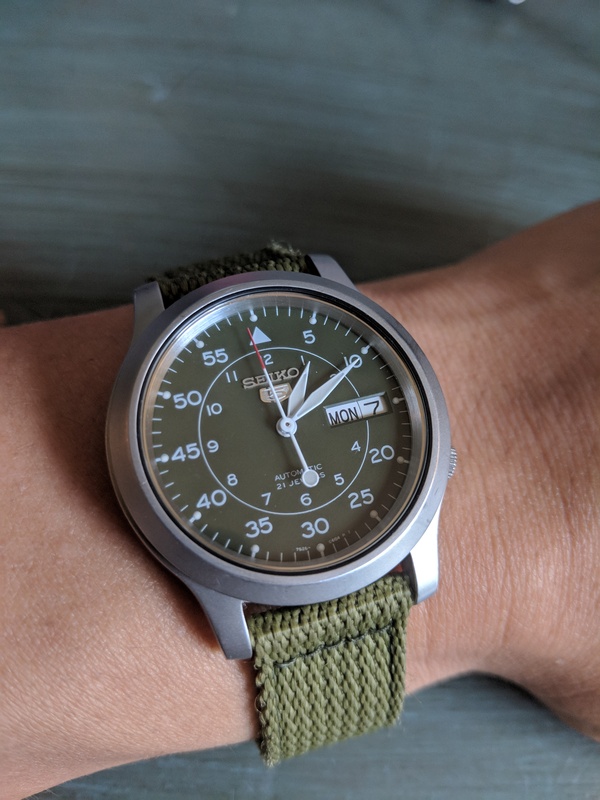 I have a SNK805 which I wear regularly. If I get some free time I'd love to take some watch making classes. Yeah I've had the metal and plastic ones from the 80s and 90s. The touch screen was amazing for the time. It had transparent touchpads that were connected to the base of the screen I believe. The problem was that if you scratched the screen you'd break the connection and then that button wouldn't work. Do you have the B dial? I really like that format. I'm not familiar with the B dial. What is it? Since then I have had an interest in Seiko. They have a neat clock in Tokyo. I saw it in the 1980s when I was there. Seiko is an amazing company and produce amazing products. When you get into high end watches made all over the world. Seiko is one of the very few that make all the parts themselves in house. 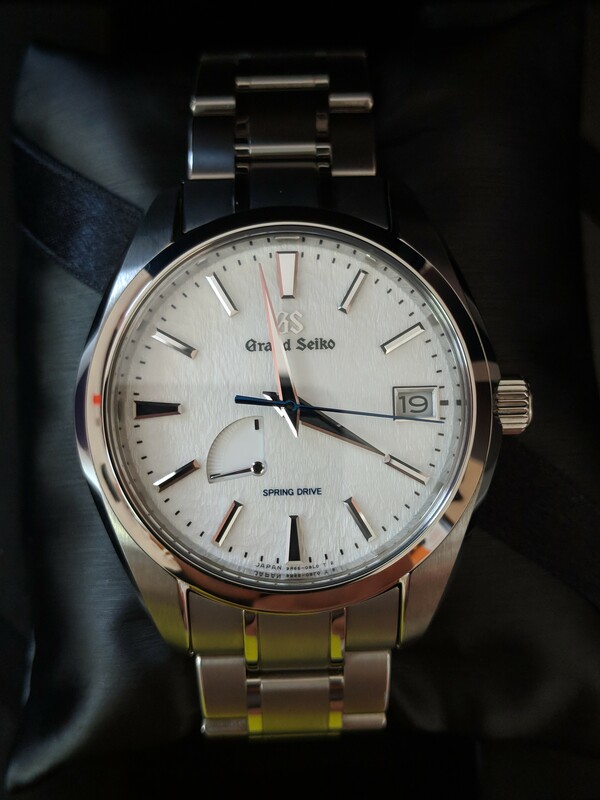 The Grand Seiko is at the very top of the quality line compared to any watch made. The price may seem like a lot of money for a watch. But it will not loose much value over time and may even go up in value depending on the condition it stays in. Seiko makes great watches... I'll pick up one of their auto-winders one of these days. Last futzed with by dcj13; October 3rd, 2018 at 09:56 AM. Very nice speedy. 145.022? Assuming it's all original it looks like it was made in 70-73. Thanks I didn't know that was called a b dial. For 50 bucks I love that watch. The price is right on these seiko watches. I have always liked the smaller size. I decided to try a larger watch. Just to see if I like it. Plus I wanted something really water proof. I got this tuna can not long ago. It has unbelievable glowing numbers. And keeps perfect time, better than anything I have ever had before. I like it’s simplicity. No date no complications and no markings on the dial. Just tells time. I think it is made by Orient. That’s Seikos other line . It has a Seiko movement. Love it. It's such a classic design. What size is it? It’s 42x14 for me that seems huge. But today’s fashion it is midsize. What I really wanted was 300 m water resistance. And a screw down crown. Sapphire crystal is also good. How I found it was looking for parts to a NH35 movement. If you eBay NH35 you find a lot of company’s use it. I also have an SNK 809 with that movement. But it has a Sinn dial. What a classic. Yeah, 42mm is about the upper edge for me. I have a black bay bronze that is 43mm that I'm in the process of selling. The bronze makes it wear a little smaller than 43, but it's still a big watch. Have you looked into a SKX007? That is an amazing watch for the money. Sub 200 fully ISO certified diver. I love mine and I got one for my brother as well. SKX have hardlex crystals so maybe that rules them out. I did put a sapphire crystal on mine and my brother's. It makes it look a lot nicer. I was just about to buy the 007 when I found the one I have. Same sort of price. My real issue with divers watches is they all look like a Rolex. Nothing wrong with that but not my style. I sort of collect pilots watches. I'm also a big fan of the Hamilton pilot style watches.